The activity was developed on Tuesday, April 17th within the premises of the Youth Center FORTES and started by informing all those present the purpose and methods to conduct Forum Theatre. Forum Theatre is a form of expressing the human relations, and with the assistance of the public to find solutions to the problems presented in the play. Therefore, we can understand some of the problems in today’s society. After a few moments of brainstorming, the team “Tomorrow starts today” chose the characters and the situation that will presented, by analyzing the current problems that young people are facing nowadays, and began the rehearsals. One of the main parts in Forum Theatre is improvisation. The play was presented to the public, the subject being the relationship between young people and their parents and their different opinions about the involvement of youth in the society. Then, the play was repeated, this time the “spect-actors” getting involved and making small changes in it, thus reaching a different ending. The audience’s receptivity and the enthusiasm of the actors opened new perspectives and levels of communication. Towards the end of the activity the youngsters in the audience told us their points of view about the differences between the two versions of the play, why and for what purpose they appeared. During 6-11 of March youth democracy project ,,Tomorrow starts today‘‘ team participated in the training course about advocacy. Those six days were spent in Daugirdiškės training centre together with project partners from two Romanian youth organizations. 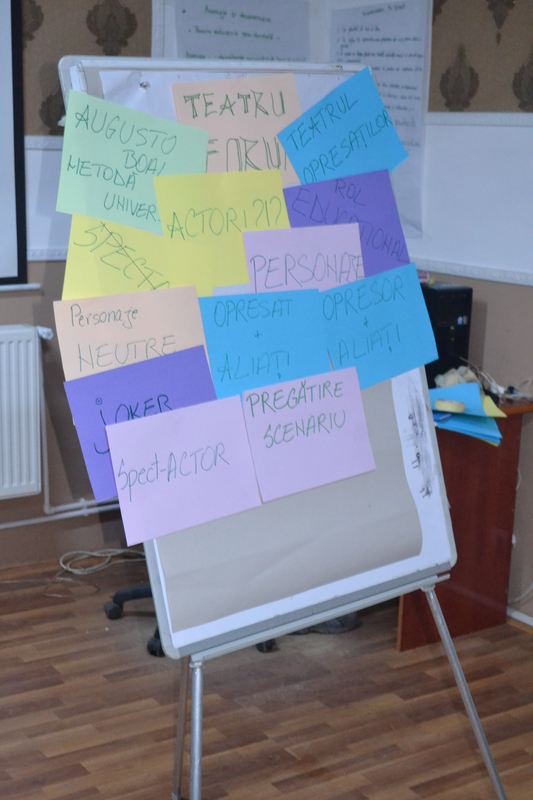 The leaders of the training were two freelance trainers – Marius Ulozas ir Šarūnas Frolenko. During the course participants learnt how to represent themselves and interests of their organizations, got to know another culture, improved their English skills and made a precise plan what they would like to change in their cities. Also, it was first step to make friends and have a great time while gaining new skills.